The SoniClear USB Foot Pedal works seemlessly with SoniClear software to simulate traditional transcription foot pedal action. Just plug the foot pedal into any USB port and SoniClear can be controlled from the three foot pedal controls. Pressing down the middle large pedal causes SoniClear to start playback. Lifting the pedal stops playback and rewinds a few seconds. The left and right foot pedal "buttons" can be used to wind forward and reverse. Or the pedals can be configured to control switching playback channels between a room microphone and stenomask for transcribing court procedings. While recording, the foot pedal can be used to take notes in SoniClear, without having to touch the computer keyboard. Press the foot pedal to annotate the recording, adding a new note or to add the next agenda item. 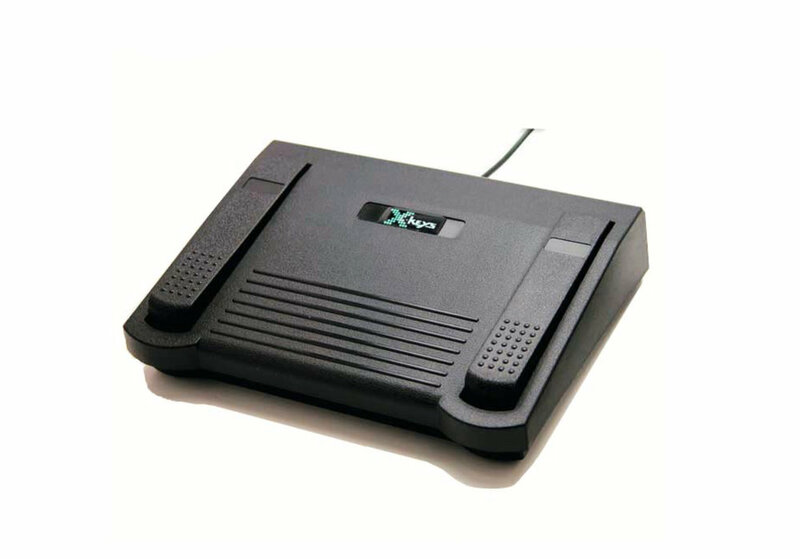 If you are used to using a foot pedal on a transcription machine, you will immediately be comfortable with the SoniClear USB Foot Pedal. The SoniClear USB Foot Pedal can be purchased from SoniClear and Authorized SoniClear Dealers and Resellers. Important Note: the SoniClear Foot Pedal is designed specifically for use with the SoniClear software. Although there are other USB Foot Pedals available that are similar in appearance, SoniClear is only compatible with the SoniClear USB Foot Pedal.